With the New Year, amendments to the Copyright Act 1968 commenced. As of 1 January 2019, copyright duration has become standardised across all types of works in Australia regardless of whether they were in the public domain or not. Until now, duration of copyright terms applied only to work that had been made public. Works which had never been published, exhibited or performed were protected indefinitely. Now all literary, dramatic, musical and artistic works are protected under copyright for the life of the author plus 70 years or from when the work was first made public plus 70 years. For material produced by Commonwealth or State governments, a standard copyright protection exists from the date made plus 50 years. These new copyright terms bring Australia into line with international copyright convention, where all works have a copyright term whether they are made public or not. Many previously unpublished but culturally valuable historic works are now effectively “out of copyright”. Among them are Captain Cook’s diaries, Henry Lawson’s handwritten notes, Archibald Meston’s indigenous language research, and handwritten manuscripts of Marie Pitt and other Australian poets. 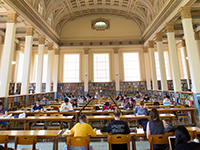 Detailed guidance available on the University Library’s Copyright website can help you to determine whether or not a particular work is still protected by copyright. The website is also the go to resource for anyone wanting to understand more about specific copyright requirements for the University in teaching, research and other University activities. This entry was posted in Legal Alerts, News & Announcements and tagged Copyright, Legislation. Bookmark the permalink.